FREE! This Halloween STEAM resource includes two fun challenges for your students, incorporating all aspects of STEM plus Art. STEAM! Halloween typically arrives at a very uncertain time of the year weather-wise. Depending on your climate, the big trick-or-treating night could roll out in the rain, snow, wind, or heat. Most kids have very definite ideas of what they want their costume to look like. At the last minute, many need to add umbrellas, toss on parkas or raincoats, or wear an extra layer underneath. But What if? This is the question that a STEM/STEAM challenge takes on. What if there is a better practical solution to a real-world problem? What if different materials or a different design would make an innovative and adaptable version of a Halloween costume for variations in the weather? The designer of just such an innovation may be sitting in your classroom right now! Why not find out? With a few basic materials and the imaginations of your students, start your Halloween celebrations with these two challenges: Create a weather-adaptable costume and design a trick or treat bag that will accessorize the costume and also be adaptable to the weather. 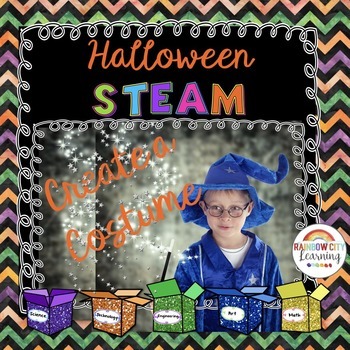 I’ve included two mini-poster challenges, a sign for your Halloween STEAM station, supply list and donation letter, as well as a mini-journal for accountability and assessment.